In December of 1978, Jay Kenigsberg started building not a restaurant, but a water slide complex in Port Aransas, Texas that was called "Texas Twister." The famous dome building was built to be used as a game room. Construction was finished in June of the next year. As Summer approached, Jay prepared for a busy season. What he wasn't expecting though, was an oil spill in the gulf that ruined Port Aransas's tourist season for that summer. Since business was so bad, the owner had to think of a new way to make a profit, and in October of 1979, he opened a restaurant simply named, "Spaghetti Works." 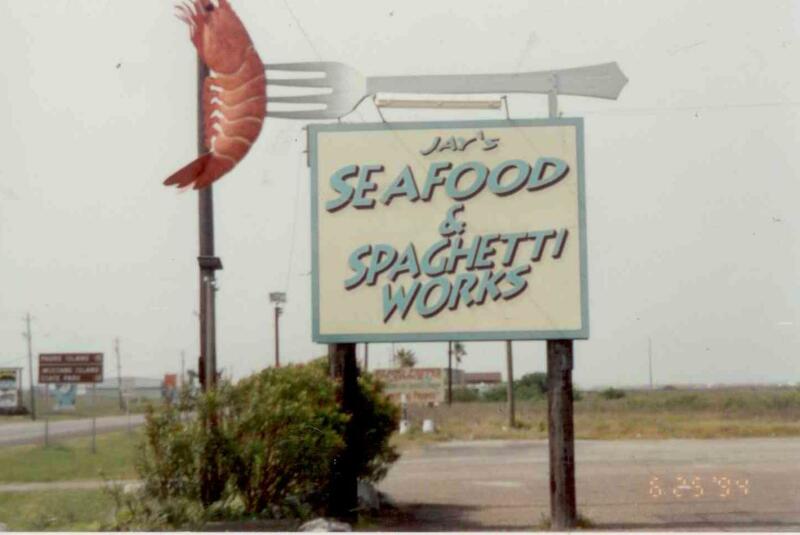 Five years later, as more dishes were added, the name was changed to "Jay's Seafood and Spaghetti Works," and in February, 1987, the water slide had to come down due to rust damage. The Original sign of the restaurant. Not much changed until 1995 when Jay's wife Stephanie opened "Stephanie's Stuff," a boutique located in the front of the restaurant. In 1998, It was expanded and in 2009, a second store in Boerne, Texas, was also added though this store closed in 2011. The famous dome roof and Stephanie's Stuff. In early 2013, construction began on a new home for Spaghetti Works and Stephanie's Stuff just south of the Dome at 910 Hwy 361. The new building, finished in late May 2013, was built in an octagonal shape reminiscent of the ol' "sky dome." Today, Jay Kenigsberg still owns what is now referred to as "Jay's," "Seafood and Spaghetti Works," and even "Spaghetti Works." Jay lives with his wife Stephanie, four daughters, Lindsey, Lauren, Whitney, and Abby, and son, Aaron. They can all be seen working in this family operated restaurant.